Tropical plants and big leafy patterns and prints are a huge trend at the moment, you'll find them everywhere! The 'Monstera' plant, also known as the Swiss Cheese Plant, in particular, has made a huge comeback from it's 1970's debut. 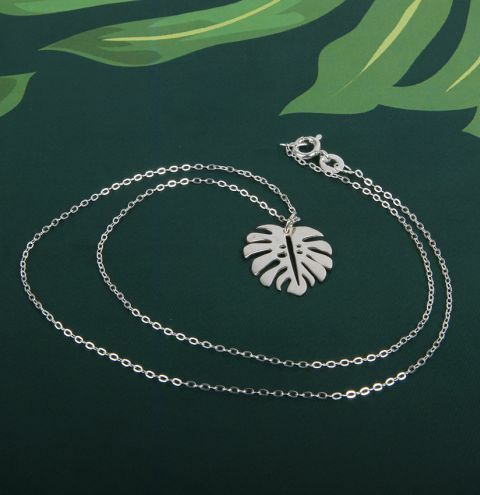 As more people are loving a little greenery in their lives this holey-leafed plant is taking over our home decor..and jewellery with our new sterling silver and gold plated sterling silver charms. Open the jumpring with a pair of pliers and link it through the hole on the top of the charm. Connect the charm to the chain by closing the jumpring around it.